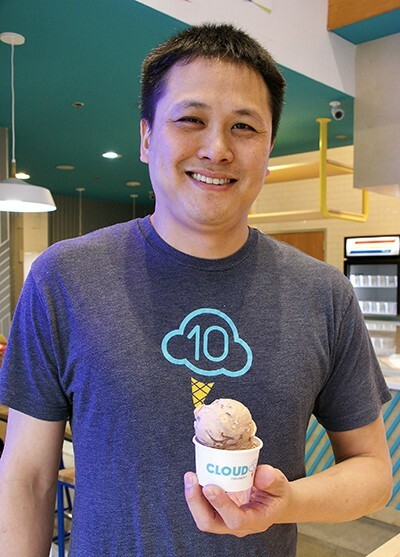 Meet Houston Chocolate Hero Chris Leung of Cloud 10 Creamery and Try His Callebaut Ice Cream! For Chocolate Heroes Month, Cloud 10 Creamery's Chris Leung has made a special ice cream treat: Milk Chocolate with a Dark and White Chocolate Swirl. Photo by White Beard Photography. On Saturday, February 9 from 2 to 4 p.m., visit the brand-new Cloud 10 Creamery location at 3201 Louisiana for a special tasting event showcasing the work of co-owner and pastry chef Chris Leung. The event is sponsored by Callebaut, maker of a wide range of fine chocolates chosen by top pastry chefs around the world for its consistency and high quality. For the event, Leung has crafted a special ice cream that uses a full range of Callebaut chocolate: Milk Chocolate with a Dark and White Chocolate Swirl “magic shell”. It is also available for all of Houston Chocolate Hero Month, which ends on February 10! Pastry chef Chris Leung of Cloud 10 Creamery. Photo by White Beard Photography. Leung is a Houston native who swapped his focus from chemistry to pastry after discovering that it was a creative outlet that also satisfied his love for precision work and experimentation. He studied under Belgian pastry chef Eddy Van Damme at Houston Community College. Next, Leung raised his profile in Houston as a pastry chef at several notable restaurants, including Yelapa, Bootsie’s (both now closed) and Kata Robata. In 2012, he joined Balcor Hospitality to open the first Cloud 10 Creamery in Houston. Since then, the ice cream shop has grown to multiple locations, including one in the Heights and the newest in Midtown. Callebaut launched the Chocolate Heroes promotion as a way to celebrate the chefs working to create these sweet masterpieces. Cloud 10 Creamery is one of eight independent Houston businesses featured during Houston Chocolate Heroes Month. View the map to see all eight participating shops. At each, pick up a Houston Chocolate Hero Month Passport and collect a sticker for each of the treats throughout the month. Once you’ve collected all eight stickers, use the attached, pre-stamped envelope to mail the passport and receive a FREE Chocolate Heroes apron!